Recorded on October 21st 2010 in London. The piece “Our Father” could and should be subtitled Bum Cheese, which are the two words that I inserted into the prayer on cue after my mother intones “Hallowed be thy…” and it was a family joke, not sure exactly where I got that from at the tender age of around 3 and a half, but I recall my mother telling me years later that because I was speaking very quietly (into the microphone) I was under the impression that I couldn’t be heard! Which is of course absurd as I was being recorded! Perhaps this was a kind of “automatic speaking”? The original piece was recorded in Somerset around 1964 by my mother who incidentally made all the tape recordings of family and friends, it must have been all those long hours she had spent working at the telephone exchange putting all those calls through that made her feel at ease with the technology of the day. My father’s passion was strictly photography and later hi-fi. For those that need to know these kind of things it was recorded on an Elizabethan Automatic 4 track reel to reel tape recorder “England’s foremost Tape Recorder Manufacturers” (Elizabethan Tape Recorders Ltd, Crow Lane, Romford, Essex). For this wax cylinder I have over-dubbed myself (some 46 years later) with the original recording. 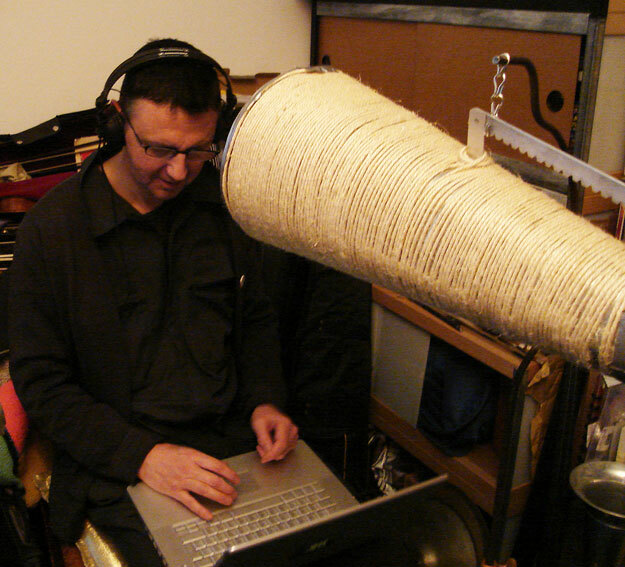 Richard Crow is an inter-disciplinary artist working in the field of experimental audio research and live performance. He utilises sound and noise in a performative way, for its disruptive and subjective qualities and above all for its psycho-physical implications for the listener and viewer. Over the past two decades his solo and collaborative site-specific installations and performances have consisted of highly conceptualized interventions into base materiality, investigations of alternative systems of organisation and research into a certain material decadence, most notably with the project The Institution of Rot which he co-founded with the writer Nick Couldry in 1992. Richard superimposed his voice onto the recorded cylinder and etched a new groove over the existing one, itself a re-recording of a digital transfer from a childhood tape. The superimposition has partially erased and distressed the original groove, causing echoes and skipping. Richard’s own voice is heard very faintly too, quietly reliving his childhood experience. The layers of time etched on this ‘wax tablet’ are revealed in the manner of an ancient palimpsest.